Semaphore: AWD, Hobart, MFU or DDGH - What's in a Name? DDGH - Destroyer, Helo Capable, Guided Missile - Major surface combatant in range of about 95 to 140 metres whole, general mission is to conduct operations with strike, ASW and amphibious forces, and to perform screening and convoy duties. Fitted with one or more force guided missile system. Fitted with a flight deck with a primary mission of operating and maintaining helicopters. The process for naming individual ships of the Royal Australian Navy (RAN) and the history behind some of our more famous ship names was described in Semaphore 4 of 2007. However, the more prosaic method of identifying ships, by designation and/or pennant number - HMAS Sydney (IV) can be identified as F03 and HMAS Balikpapan as L126 - is explained below. The system of pennant numbers in the Royal Navy (RN) began before World War I to distinguish ships of a similar class and thereby improve rapid recognition and visual communications. Initially a ship was distinguished by a single letter pennant signifying a flotilla or a particular type of vessel such as a red burgee for torpedo boats and the pennant ‘H’ for torpedo boat destroyers. Beneath each pennant was a unique number identifying the individual vessel. The allocation of pennant numbers was prepared within each fleet until the Navy Pennant List in 1910 standardised numbers across the RN. After World War II the RN further rationalised the system’s letter designators resulting in R for aircraft carrier, D for destroyer, F for frigate, L for amphibious vessels, M for mine warfare vessels, etc. The US Navy (USN) had in the meantime been developing its own system. In the 1890s, the USN began using a ship type and a one up numbering system. Hence USS Indiana was referred to as Battleship No. 1 which was soon shortened to B-1. In 1920 the USN standardised its system and expanded it to include all US Coast Guard cutters. This system allocated two or three-letter class designators to each ship type, and retained the one up numbering system. The first aircraft carrier, USS Langley, thus became CV1, while USS Bainbridge, the first USN destroyer, became DD1 and the first submarine, USS Holland, received the designation SS1. Today, the RAN, like most Western navies, employs the NATO standard for describing and comparing the broad roles and capabilities of naval vessels. This system is contained in the NATO Standardization Agency publication STANAG 1166 MAROPS (Edition 7) - Standard Ship Designator System. STANAG 1166 is not publicly available, but reference publications such as Jane’s Fighting Ships routinely adopt the NATO standard and provide similar information. For each of these groups a system of two, three or four letter designators exists which defines a ship or submarine’s category and principal role. In addition to the letter N, which as already noted signifies nuclear propulsion, other common suffixes include, G – a unit equipped with one or more force guided missile systems and H – a unit equipped with a helicopter, or capable of operating a helicopter or vertical or short take-off and landing aircraft. A surface combatant in size range of about 75-150 metres. Generally has lighter armament than a DD. Fitted with one or more force guided missile systems. Fitted with a flight deck with a primary mission of operating and maintaining helicopters. With their current and planned equipment fits, both the Anzac and Adelaide classes should therefore be included within this definition, notwithstanding their more commonly used simplified designators as FFH and FFG respectively. Under the STANAG support craft and non-commissioned single purpose vessels within naval bases are also allocated designators. For example, Defence Maritime Service Wattle class stores lighters based in Sydney and Darwin are designated YE (lighter, ammunition), and the sail training vessel Young Endeavour is designated as AXS (training ship sail (naval)). Government owned coastal patrol unit intended for basically coastal guarding function. Includes any coastal patrol ship under 45 metres which cannot qualify as a PG in armament. May be unarmed. Pennant numbers are identification numbers painted prominently on most naval vessels. The RAN largely followed the RN system until 1964, and then fully adopted USN style pennant numbers in 1969. The RAN draws these numbers from a block allocation made in Annex B of the Call Sign Book for Ships (ACP113, Edition AH). These blocks of numbers are allocated by ship type and country. For example, the Anzac class are numbered 150-157 because the frigate hull numbers from 150 to 168 are allocated to Australia, as are 01-07, 20-23, 442-449 and 531-539. Similarly, the three new Hobart class destroyers have been allocated numbers from within Australia’s destroyer block 38-42. 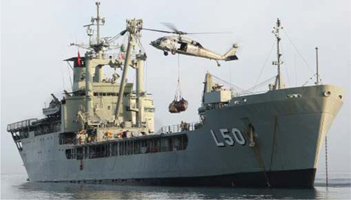 The process is not entirely random, however, and to maintain a tangible connection with the previous DDGs HMAS Hobart (II) and HMAS Brisbane (II), the decision has been made to again use 39 for Hobart (III), and 41 for Brisbane (III). HMAS Sydney (V) has been allocated 42. The allocation by both type and country explains why there can be duplication in hull numbers. Australia currently has patrol combatant 83 (HMAS Armidale) and mine hunter 83 (HMAS Hawkesbury) in commission simultaneously. There are a number of similar examples in our recent past including HMAS Jervis Bay (I) and HMAS Fremantle (II) which both wore 203, and HMAS Tobruk (II) and HMAS Swan (II) which both wore 50. With the notable absence of the US and Canada, other navies which use the ACP113 allocation include Belgium, Germany, Denmark, France, United Kingdom, Greece, Italy, Kenya, Malaysia, Netherlands, Norway, New Zealand, Poland, Portugal, Spain and Turkey. Each nation is responsible for the avoidance of visual call sign duplication, but such overlaps do still occur. Thus HMAS Benalla, HMNZS Kahua and the Spanish ship Martin Posadillo all carry the pennant number A04. The armed forces have always favoured acronyms as a form of linguistic shorthand, jargon which is often indecipherable to outsiders. This has led to a range of classifications for ships which are not covered by the STANAG, but which have found their way into common usage. In the early stages of a defence project when the exact form of a ship is yet to be determined, a generic descriptor of its purpose suffices. The AWD was accordingly a ship highly capable in air warfare, while the ‘modular, multi-role class’ included in the 2009 Defence White Paper is currently known as the Offshore Combatant Vessel (OCV). The AWD project is set to deliver the Hobart class DDGH from 2014 and the OCV designator will become clearer as the project progresses. The terms MFU and MWV are of largely administrative significance. They allow for categorising levels of command, remuneration and career progression, structuring training continuums for both individual and collective training, and delegating financial responsibilities. The words minor and major are not intended to imply a hierarchy of operational ‘usefulness’ – all RAN units contribute to a balanced force which is able to undertake the full spectrum of operations in the maritime domain. Warships are among the most complex machines ever created by humans. Any sailor will know that individually they are quite distinct, yet commonalities of role, equipment and size lend themselves to a myriad of systems of taxonomy and classification. While attempts will always be made to impose order through a standard method of designation, class and hull number, the inherent complexity of the task will continue to impose limitations. In truth, mariners will always feel compelled to invent their own systems for their own purposes, and give their ship its own particular place in the wider scheme of things. ↑ Navy Department, Classifications of Naval Ships and Craft, SECNAVINST 5030.8, Washington DC, 2006, <www.history.navy.mil/danfs/secnav_2006.htm> (30 July 2010). ↑ Department of Defence, Australian Defence Glossary, version 5.1.7.3, Canberra, 2010.